A few weeks ago, I picked up a great unique bargain from Bespoke Bows N Cute Kicks. 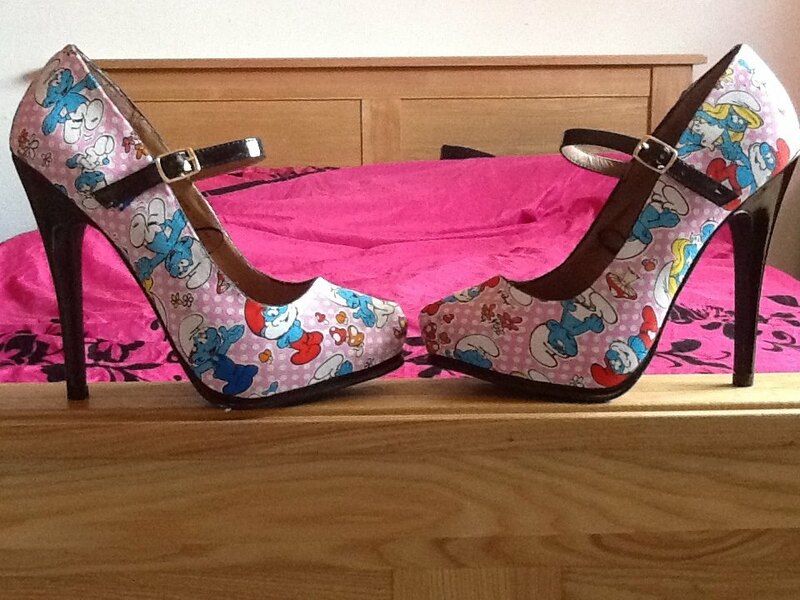 I'm not normally a heels girl, I love my wedges but I knew I had to have these beauty's. My kids are going though a crazy smurf stage too, so I knew these had to be mine. I love uniqueness and I just thought these was super cute. I won a competition on Facebook a while ago and won a stunning leopard print bow for Lexie. Jamie The owner makes an array of Bespoke, custom made to order Flat Pumps, Heels, Stiletto's, Wedges, Clutch bags, Hair-bows, Bow Ties, Pushchair Hood Bows & cushions. Her Mission is To supply the universe with Beautiful things at great prices and bring back the unique one off's in fashion. Its simple to order you choose the fabric, shoes & add on's how you want them. With a two week wait you can have the shoes of your dreams.